The bestselling story behind Ross Hunter’s classic melodrama starring Susan Hayward and John Gavin. When “fly girl” and gorgeous socialite Ray Schmidt first meets Walter Saxel in Cincinnati, their attraction is instant and everlasting. As their bond deepens, Ray finds herself envisioning a future with Walter, until one fateful day when the settling of her family affairs interferes with their plans to meet, and his relationship with another woman forms. Though years pass and Ray manages to carve out a life for herself in New York City, Walter remains in her memory, and a chance run-in with him leads them both to fall into their former ways. What unfolds is the fascinating tale of what life was for selfless, devoted Ray, a prisoner to her love for the one man who would never fully love her back. 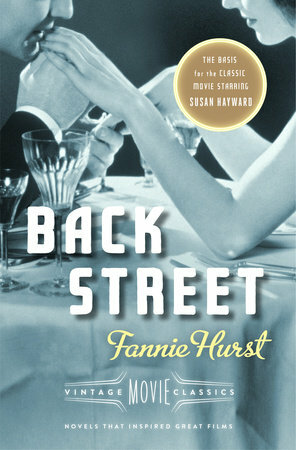 Originally published in 1931, this bestselling classic novel about the heartbreak of living along the “back streets” of a man’s life was adapted into film three times. With a new foreword by Cari Beauchamp.